Clean the duck clean and cut into pieces. Marinate duck with pepper powder, salt and vinegar. Grind shallots and garlic. Mix this paste with coriander powder, turmeric powder, garam masala by adding little water. Heat coconut oil in a kadai. Saute onion, green chillies, chopped ginger and garlic, When onion turns brown in colour, add ground masala and saute. When the raw smell of the masala disappears, add marinated duck pieces and mix well. Cook till the masala is coated well on to the duck. Now add second extract of coconut milk. Now transfer this to pressure cooker and pressure cook till the duck is cooked well. When cooked well, add potatoes and tomato. Cook well till the potatoes are done. Now add first extract of coconut milk and when it is starts to boil, immediately switch off the stove. Heat oil in a pan. Add shallots, dry red chillies, and curry leaves. When shallots turn brown colour, switch off the stove and pour over the duck curry. Mullapanthal is a very famous toddy shop in Ernakulam, Kerala. 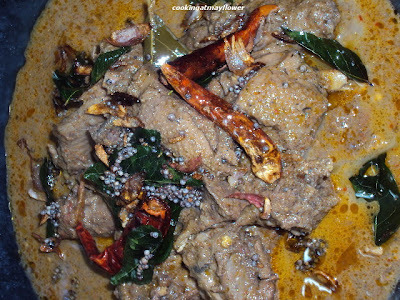 They are famous for their tasty curries such as crab curry, karimeen curry, duck curry. The place is famous among tourists and families from the locality. 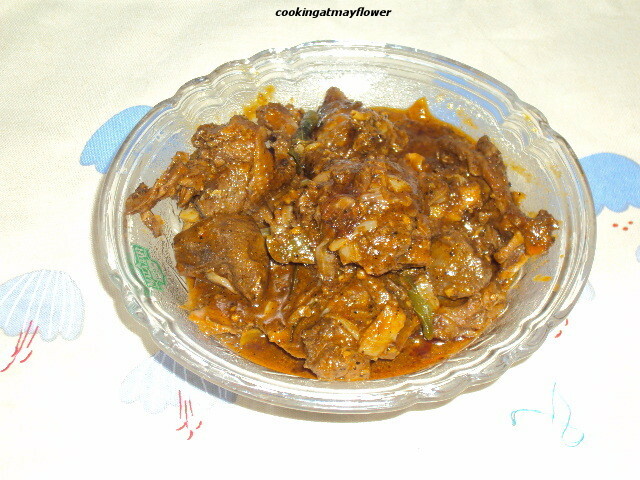 The recipe for duck curry is from Mullapanthal. Heat oil in a pan. Saute chopped onion, ginger, garlic, green chillies and curry leaves well. Add chilli powder, turmeric powder, coriander powder and mix well. Now add tomatoes and duck. Transfer this to a pressure pressure cooker and cook till they are done. Once the duck is cooked, add the ground mixture (to grind) along with 1/2 cup of warm water. 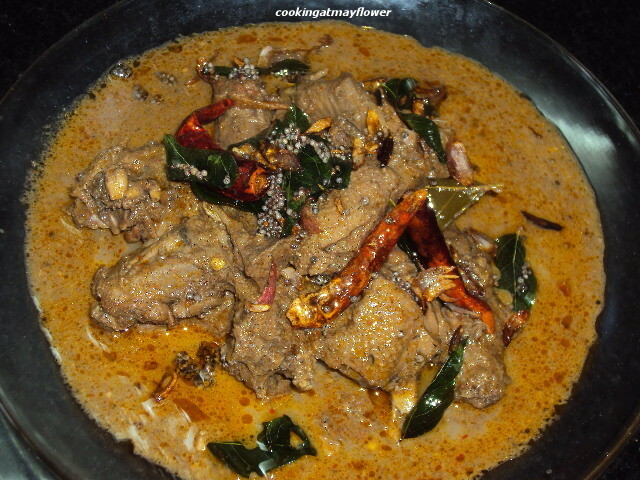 When the gravy starts to thicken and the duck is cooked well, pour coconut milk to the duck curry and allow it to heat up (don't allow it to boil) and switch off the stove. In another pan, splutter mustard seeds and dry red chillies. Pour this to the above duck curry . This duck curry goes well with tapioca upma, pidi, or boiled rice. This is a family favorite .I often make it for our guests as all of them love it . This curry is popular in my son's and daughter's friends circle. Pressure cook duck along with green chillies, ginger, curry leaves, pepper powder, turmeric powder, coriander powder and salt, till meat is tender usually 3-4 whistles ( time depends on the duck you are using, some take a little longer) . Dry roast and grind 3rd ingredients and keep aside. Heat oil in a kadhai, saute onion, garlic and curry leaves, till it starts to brown. Now add coriander powder, chilli powder, turmeric powder, and pepper powder. Now add ground mixture as shown above. Saute in low flame for a few minutes. When the raw smell disappears, add duck along with the stock. When the gravy thickens, curry is ready to be served. Optional: If needed you can add coconut milk, but it brings a different taste and colour to the dish. I dont use coconut milk as I feel it is best served without it. 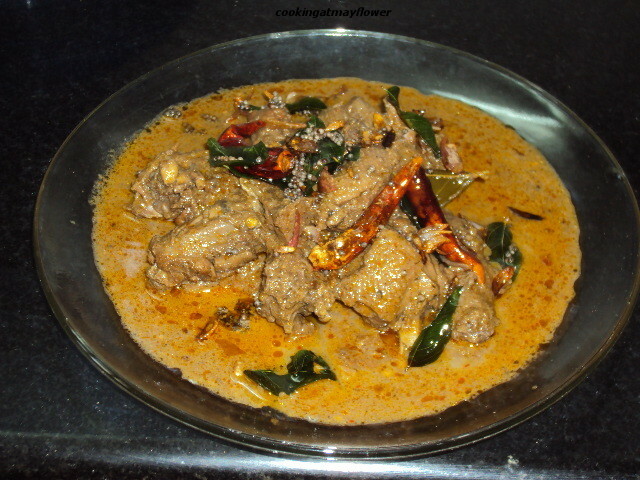 The taste of the pepper powder should be prominent and that makes the curry very tasty. Serve hot with appam, puttu or rice.